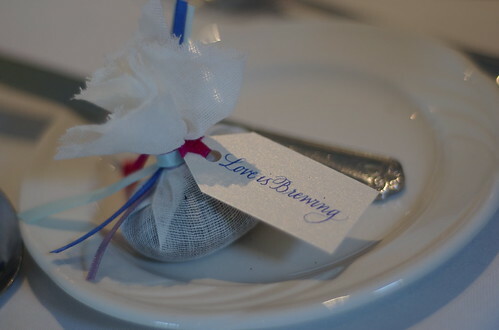 Coffee and tea favors can be everything from the kind that is edible to some that look edible but are not. The options range from candles to personalized bags of coffee. A tea lover who is about to get married would love to get a heart shaped tea time tea infuser. This type of gift is for the real tea enthusiast who consumes tea in the loose leaf form. You may also give it to someone and give them some loose leaf tea, to introduce them to the traditional way of making a cup of tea. You might also want to include a heart shaped scoop to scoop out their tea. This setting could also be accented with the porcelain or silver tea pot place card holder. There is a tea infuser that could be matched with the bouquet of your wedding. This infuser comes in a variety of flavors and is an elegant addition to any "tea time" wedding. Whereas the coffee lover may really appreciate an elegant personalized coffee kit which consists of 2 oz of coffee in a groom or bride bag with a personalized tag and a heart shaped chrome spoon. This would make a really elegant addition to your table top. There are also a pair of silver chrome coffee spoons that would make a great favor. The "perfect blend" personalized coffee flavors are a bag of coffee to make an 8-10 cup pot of coffee. There is also the Jack Daniels coffee grounds, which would be a great gift for you're a wedding shower or grooms wedding party, you can also get Frangelico coffee grounds for those with a taste for liqueur and the Ghirardelli Coffee for the chocolate lovers. So all tastes and flavors can be met. There are also coffee cup candles, which have a really realistic scent of coffee. Imagine if this was a gift to be opened the morning after the wedding, so you can start the day to the wonderful scent of coffee. I don't really understand the term “wedding favours”. The article talks about giving tea or coffee related gifts to the bride to be. It then goes on to talking about this gift as part of a table setting. I’m confused. Does the writer mean favours are wedding shower gifts? I always thought favours were some small token remembrance gift for wedding guests but I'm not really on board with this concept. It seems to me that the cost of a wedding is already often quite horrendous and I can't imagine why guests should need a gift for their attendance. Doesn't the invitation serve this purpose. As for the gifts, yes, tea or coffee is ok for a shower gift but not something particularly special in NZ . Infusers are often a bit of waste of time as most people in NZ use bags or a teapot. A tea infuser that matches the brides bouquet? Don’t understand as this detail wouldn’t be known till after the wedding and I don’t even think such things are available in NZ. Tea/coffee spoons and scoops, teapot mats, coffee candles.. Sorry, for me, rather than being helpful and interesting, this article reads like an advertisement for a shop more than anything else.